Finally, after months of teasing Bandai is gearing up to release it’s forthcoming S.H.Figuarts Shinkocchou Seihou Kamen Rider Kabuto Hyper Form. Ahead of the actual pre orders going live, Bandai’s Tamashii Tamshii Web Page was just updated with all of the release info in addition to some teaser images. 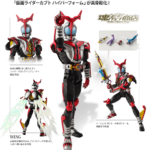 Pre orders for S.H.Figuarts Shinkocchou Seihou Kamen Rider Kabuto Hyper Form will open September 16th, 2017 and will see a release sometime February 2018. The Figuarts will retail for a rather pricey at 7080 yen, but will include removable Zecters, and a pair of impressive effect wings. Tamashii World Tour: S.H.Figuarts Shinchokou Seihou Eternal, Kabuto, Retsu Ichijouji and more! 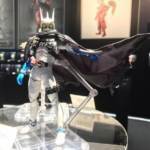 Photos from Bandai’s Tamashii World Tour event have surfaced coming courtesy of TAGHobby and we have a plethora of new S.H.Figuarts reveals from that event! First off, we have two new additions to the S.H.Figuarts Shinchoku Seihou line with Kamen Rider Eternal and Kabuto Hyper Form having been revealed. And for you Metal Hero fans, there’s the Space Sherif Gavan’s human identity: S.H.Figuarts Retsu Ichijouji along with a better look at some previously announced stuff like Gemm and Neo Amazon. Do note that none of these new reveals have been given release information as of yet, and as of this posting remain as display only pieces.